We think Cycle Poland is awesome, and you should join us for Cycle Europe 2019! But we know we're biased, so we asked cyclists from previous rides for their thoughts about the ride. Stuart Maleno works as a lawyer in London. He was part of the very first Cycle Poland in 2010 and has taken part in three Cycle Poland rides. Cycling is now his main sport – he loves to combine it with travelling. We talk to him about what makes Cycle Poland special, and his advice for anyone considering joining the ride. What makes Cycle Poland unique for you? Definitely the personal connection. With Cycle Poland you not only receive a list of equipment that the charity has bought with the money you raised, you also visit hospices and deliver that equipment yourself. No other ride or charitable event gives you that personal connection. You see and meet the people you help. It’s an emotional experience and the thanks you receive are very touching. The other thing that makes the ride unique is the mix of local Polish riders and people from Britain and further afield; on most other rides everyone is from just one country. The social part of the ride is great – I really enjoy the evenings when you gather over a beer. Even if you don’t speak the same language your common goal helps you connect and communicate. Cycle Poland is also a great way to see the country and learn about Polish culture – especially the food! What place in Poland sticks out the most for you, and why? I’ve enjoyed the historic and cultural spots: Kazimierz Dolny, Toruń, Kraków. I also like the landscapes and incredible views, especially in the mountains. The places we stay in are often unique and full of character – hotels, castles, eco-friendly farms. What did you learn about Poland, Polish culture, Polish people? I'd been to Poland before, but I never saw the warm reception you get as part of Cycle Poland. People welcome you and feed you so much it is unbelievable! 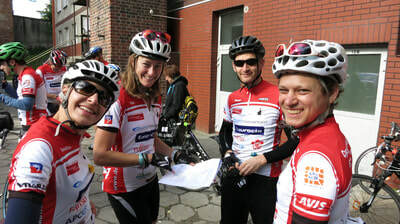 The other riders too are incredibly friendly, warm and welcoming. You don’t get to experience that hospitality, warmth and generosity as a tourist. Meeting Damian Zieliński was great! I have never been to a charity event of this size where an Olympian comes along to chat and ride with the participants. That was very cool and unexpected. What is your advice to someone considering taking part in the ride? The main thing is that this ride is within everyone’s capabilities. 9 days on a bike is daunting if you’re not used to it, but physically it is within everyone’s realm provided you do some training. You don’t have to ride at 30 km per hour – some people will ride slower, others faster, you can find your own pace. My biggest advice is to go out for a few days in a row as part of your training, even just two days makes a huge difference. You don’t have to go out for very long, but it is good to get your body used to doing back to back rides. If you have never done a multi-day ride, be mentally prepared. You have to ride every day for nine days, no matter what the distance or the weather. What helps you get through is that you are part of a group with the same goal and everyone helps each other - you reach your goal in the evening and feel that camaraderie. The other thing that helps is the hospice visits, which really help you put your own troubles behind for a while. You may spend two hours in the rain but you can think “I am going through nothing compared to others” so you get on with it. Finally, be prepared to have fun! You are there for a serious propose but will also have fun and meet people. Be open to new experiences: meeting people from a different culture, learning some words of a new language, trying new food and drink, exploring a new country. The biggest thing I would say is just do it, because it is such a unique experience. You just need to see the number of people who have been back and done Cycle Poland more than once. That says it all! Be like Stu: sign up for Cycle Europe 2019.